Rick’s Picks is your source for things to do in Fairfield each month. We’re highlighting comedy, easter egg hunts, outdoors and community service for the month of April. Regarded as one of the best joke writers in the business, Gary has appeared on America’s Got Talent, Conan, and the Late Night Show with Colbert. A regular throughout NYC comedy clubs, Sherrod has performed on Tough Crowd, Premium Blend, and The Chris Rock Show. Be freezin’ for a reason with this polar plunge to benefit the CT Special Olympics. Cruise out for the chance to see some of the seals and waterfowl that spend their winters in Long Island Sound. Join the Maritime Aquarium to help clean and restore the shoreline with live music, face painting and more. Volunteers are needed to help plant marsh grass, remove invasive species, install deer fencing and clean the beach. Featuring a DJ, food trucks, a family fun zone, and the annual Children’s Easter Egg Scramble, and new this year is the Adult Sundown Easter Egg Hunt with raffles for great prizes. Hunt for eggs and take a photo with Lucas the Stag and the Easter Bunny at the Alumni & Family Easter Egg Hunt. Families are asked to bring non-perishable food items for donation to the CT Food Bank. Mount Calvary Baptist Church plans a SonRise service from 5:30 to 6:30 a.m. Sunday (April 21) in the south parking lot of the church at 1735 Enterprise Drive, Building No. 3. Services will also take place at 7:30 a.m., 9:30 a.m. and 11:45 a.m. inside the Fairfield church. Mount Calvary will have an Easter Sunday service at 10:30 a.m. at 601 Whispering Bay Lane in Suisun City. Am Ordinance of Baptism service is scheduled at 11:45 a.m. at the Fairfield site. For more information, call 425-1949. First Baptist Church will host a community egg hunt 10 a.m. Saturday on the Clay Street side of the campus. The church is located at 1108 Washington St. in Fairfield. For more information, call 422-2500. Calvary Baptist Church plans an Easter musical called “Mo More Night” at 9 a.m. and 11 a.m. Sunday at the church, 600 Gregory Lave in Fairfield. 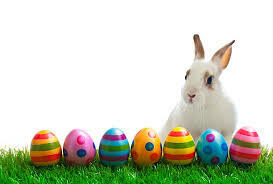 Easter egg hunts for children are also planned. For more information, call 422-7037. Holy Spirit Catholic Church will host Easter Sunday services at 6 a.m. in Spanish, at 7:30 and 10:30 a.m. in English and at 2 p.m. in Spanish. The church is located at 1070 N. Texas St. in Fairfield. For more information, call 425-3138. Our Lady of Mount Carmel Catholic Church plans Easter Sunday Mass at 8 a.m., 10 a.m. and noon at 2700 Dover Ave. in Fairfield. For more information, call 422-7767. Community United Methodist Church has scheduled its annual Easter egg hunt and potluck Saturday, an Easter sunrise service at 6:30 a.m. Sunday and a second Easter service at 10:30 a.m. Sunday. The church, located at 1875 Fairfield Ave. in Fairfield, will have its sanctuary open from 9 a.m. to 4 p.m. For more information, call 426-2944.